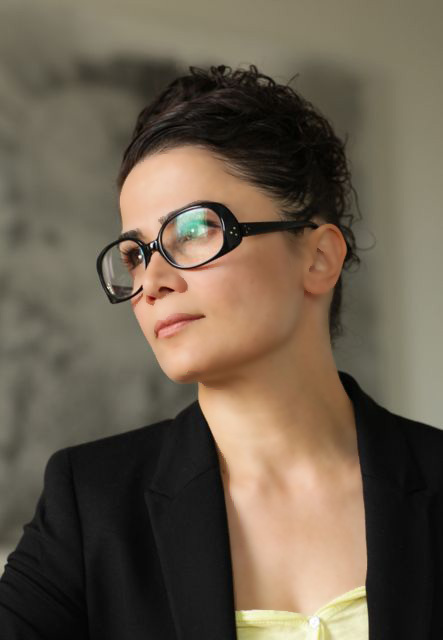 As a visual artist, Mojgan Moslehi integrates various media with techniques such as painting, photography, installation, objects and artist books. The artistic journey of Mojgan Moslehi began with a series of monochrome paintings that primarily reveal a breath-image, where the idea does not embody any precise determination, and there is a minimal presence of matter. Her works are created on a variety of surfaces with concise choice of color : a pervasive black embraces both absence and presence; the analysis of the material comes into play through a continual reworking – erasings, shimmers, distant echoes, wavelengths issued from other worlds. In Moslehi’s artistic expression the photograph occupies a privileged space : framing, unfocused, use of speed to erase forms, insipid subject matter such as clouds and fog, darkness and night, liquid disfigurement, disappearance on ignition; she captures fleeting states, the spaces in-between, presence through the unreadable. It is the return of the subject, but destroyed. Her photography, far from acting as a recording, a compact reference, attests rather to the imponderables – circulation and spill-overs, erasing the boundary between the positive and the negative.Objects are freed from their known functionality. She offers them a new life existence by uniting their inner emptiness with a mode of being in a world without a name, without obligation to be useful. through an exchange program by the Iranian Ministry of Culture, she moved to Paris and lived at the Cité Internationale des Arts. She has had many solo and group exhibitions, including the Cité Internationale des Arts (2000), the Assar Gallery (Tehran, 2001), Itinerrance Gallery (Paris, 2006), the National Museum of Art (Nanjing 2008), and the Museum of the China Academy of painting (Beijing, 2010) … Following a Masters in Fine Arts in 2001, she defended her thesis entitled The Art of Void – The Presence of the Void in Contemporary Art at the Sorbonne in 2010. After collaborating and exhibiting with Michel Sicard, in Seoul, Beijing and Nanjing, they have formed an artist duo, merging their work; both working on joint projects and concepts under the surname, Sicard & Moslehi.